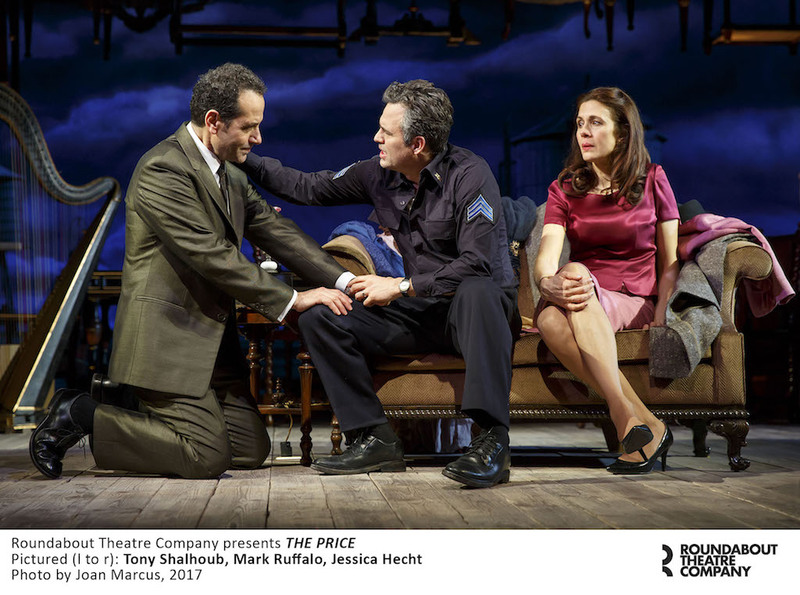 One of America’s greatest playwrights is once again lauded on a Broadway stage at the Roundabout Theatre Company’s American Airlines Theatre in this fourth revival of The Price, which originally opened in 1968. 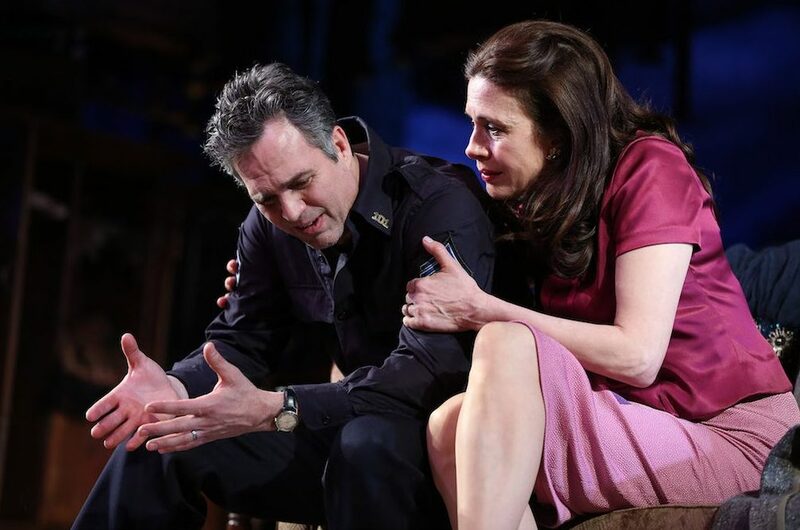 It is the dated, but always relevant portrayal of family discord, resentment, disappointment and frustration, directed by Terry Kinney, as the battle begins on the fifth floor of the building, soon to be demolished, where the family once lived. It is filled with the furniture and memories of the past where two brothers are set to meet an appraiser to sell the estate. Money, money . . . makes the world go round! 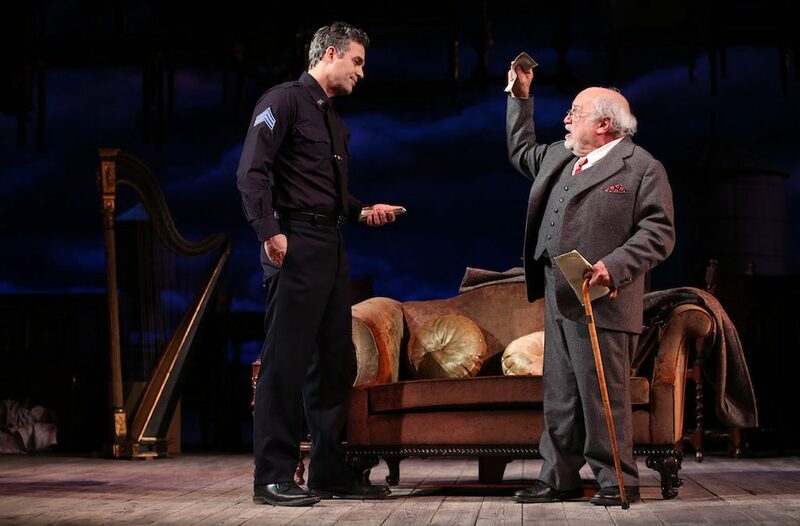 Victor Franz (Mark Ruffalo), a soon to be retired policeman, puts a laughing record on an old gramophone that makes him chuckle, lunges in pain as he dons his mask and foil from his youth, and plucks on a grand old harp as he waits for his wife, brother and the appraiser to arrive. 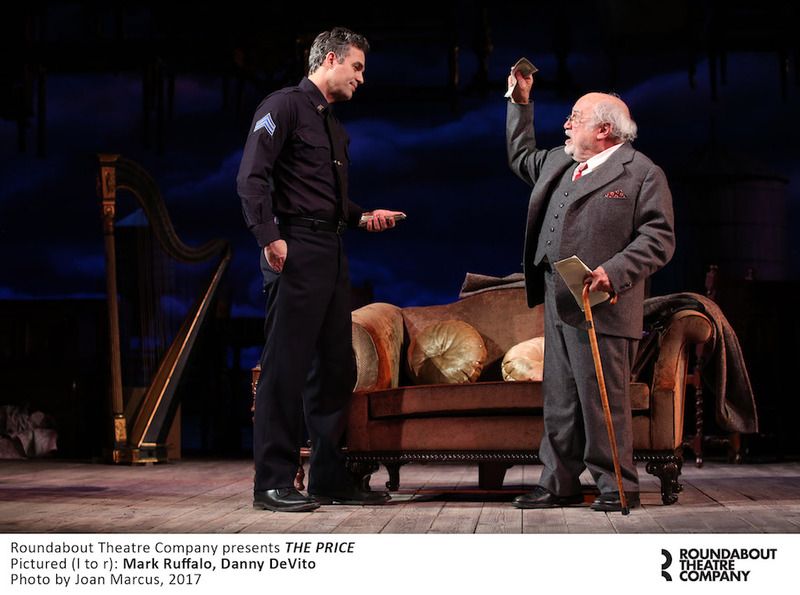 First up the creaky old stairs is the 89 year old appraiser (Danny DeVito), one of Arthur Miller’s funniest characters, setting the stage for a negotiation that turns not only into a therapy session, but delves deeply into the human psychie. The hearty laughs in Act I, belie the pain and sorrow of what’s to come. When Esther (Jessica Hecht), Victor’s wife, makes her way up the old stairs, looking charming in a new pink suit, she is complaining bitterly about her life that lacks money because of a husband who suffers from his weakness and inability to take action – an inertia causing cracks in their marriage. She’s pushing him to retire, get a more prestigious job and take time out for traveling, hoping the money from the estate will change their lives. He was once a promising science student caught in the web of a manipulative father when the old man tried to live on meager amounts remaining from a grand lifestyle pre depression, throwing them all into poverty and eating ‘garbage.’ It was Victor to the rescue, giving up his potential, while his brother Walter (Tony Shalhoub) became a successful surgeon. Unbeknownst to Victor, at the time, was a phone call from Walter to the father offering $500 for Victor’s education and freedom, which Victor never knew. And if he had. . . would it have changed anything? The brothers haven’t spoken over 16 years. During all that time, Walter (perhaps to assuage his guilt) sent $5 a month to his father, while Victor sacrificed so much more. When Walter finally arrives, he attempts to make amends explaining further that his practice keeps him so very busy, that he’s gone through a divorce and reluctantly reveals that he was hospitalized for 3 years having had a breakdown; offering Victor, not only all the money from the upcoming sale but, a job at the hospital where he practices upon Victor’s retirement. As the brothers verbally spar about the past, pointing fingers at one another, it’s obvious that neither of them is willing to see nor understand the other’s perspective. It’s a stalemate of continued attacks and resentments while Esther attempts to make the troubled Victor see more of the truth, and be forgiving. Victor, prior to Walter’s arrival, has already accepted a meager sum from Solomon with no real effort made to negotiate for more, adding fuel to the already burning fire of Esther’s frustrations. All the while, Solomon the appraiser is shifted from the furniture laden room to a back bedroom (unseen). But there’s no keeping him quiet as he continuously pops back to have his say and philosophize on the matters of discussion – the comic relief in the highly charged emotions that keep flying between the family members is well placed. 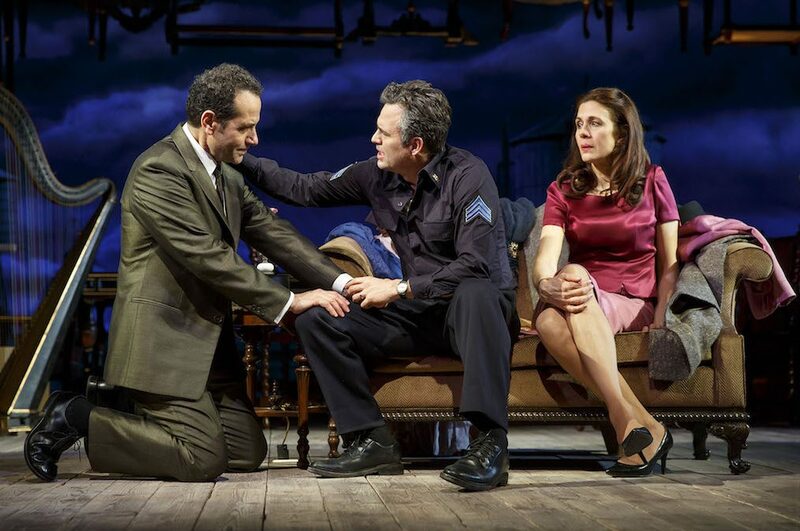 These are award winning performances by a stellar cast – Ruffalo filled with an unrequited resentment; Shalhoub digging deep to hide his emotional void; DeVito offering the perfect humorous relief, and Hecht as the discontented but compliant wife, as Arthur Miller forever seeks truth. The shabby scenic design of hanging and piled up furniture and old memories is by Derek McLane. Costumes are by Sarah J. Holden with lighting design by David Weiner. The Price. 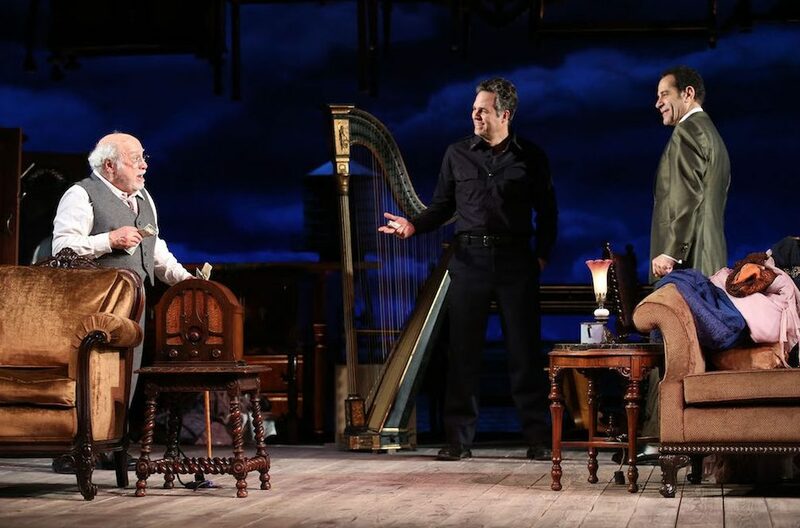 Through May 7 at the American Airlines Theatre, 227 West 42 Street (between Seventh and Eighth Avenues), www.roundabouttheatre.org run time: 2 hours, 30 minutes (15 minute intermission).